Click to enlarge Source: Weiner SJ, Schwartz A, Sharma G, et al. Patient-centered decision making and health care outcomes: an observational study. Ann. Intern. Med. 2013;158(8):573–9. [Accessed November 3, 2014]. 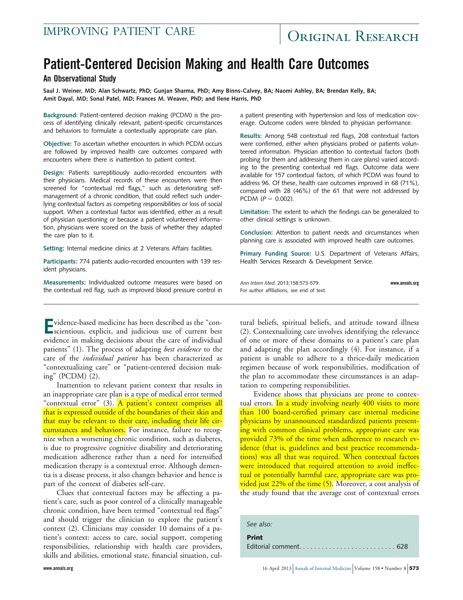 In my last post on listening ( see: Just Read: Just 6 more seconds of listening needed to elicit the patient’s agenda | Ted Eytan, MD ) I said I couldn’t find a newer study than 1999 … and then I met the author of this paper, Saul Weiner, MD, at the Center for Total Health (@KPTotalHealth) via an intro by Alan Spiro, MD (@AlanHSpiro), who it turns out is studying patient-physician communication, and steered me to this paper. As with the previous papers I reviewed, this study involved the audio recording of patient-physician visits, with a twist. With prior physician consent, patients were randomized to bring in a concealed recording device without the physician’s knowledge for a particular visit. I’m imagining a patient checking in for their doctor visit and then being approached by a research assistant to slip a recorder in their pocket. Patients do want to help if we let them 🙂 . 403 encounters were analyzed which contained a total of 548 “red flags” “including missed appointments; nonadherence with medications; poor control of a chronic condition, or lack of follow-through with laboratories, tests, or referrals.” Audio recordings were also screened for red flags (“Doc, I can’t afford these pills”). patients with a contextualized care plan were more likely to have a positive outcome (odds ratio [OR], 3.7 [95% CI, 1.2 to 11.4]; P 􏰀 0.021)…When the patient had seen the same resident at their most recent visit, they were more likely to have a positive outcome than when they had seen a differ- ent physician, regardless of whether the care plan was con- textualized (OR, 3.0 [CI, 1.0 to 8.9]; P 􏰀 0.044). It’s a little hard to visualize this with a chart since there are many dimensions; I did my best. So there you have it, listening for 6 seconds longer elicits the patient’s agenda, and listening and planning in the context of the patient results in agendas with less problems down the road. 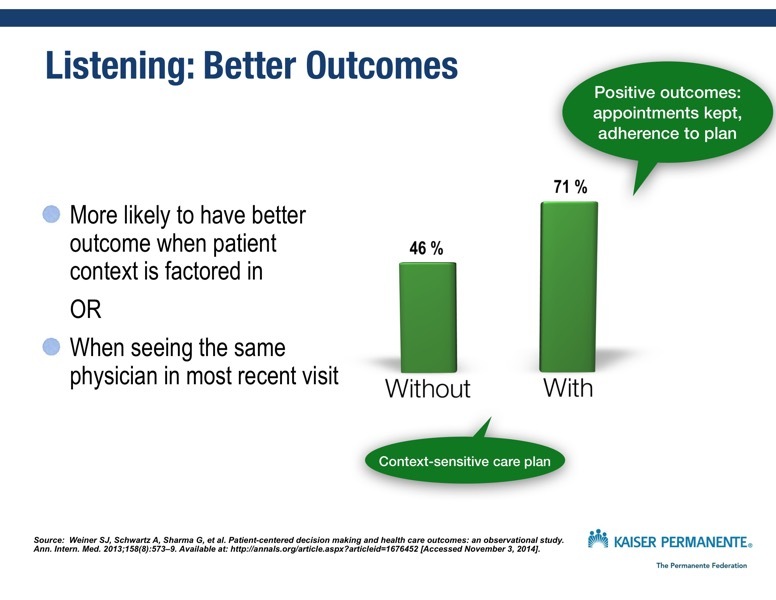 @BurbDoc Listening improves patient outcomes. I’m delighted you included our study on contextualizing care and health care outcomes in your blog. You provided a nice summary and helpful insights. One additional thought comes to mind….you mention the importance of listening a bit longer to patients (“… listening for 6 seconds longer elicits the patient’s agenda….”)…interestingly in another study we did, using unannounced standardized patients, where we could send many doctors the “same” patient (i.e. an SP who behaved the same way at every encounter) we discovered — to our surprise — that encounters in which essential patient context is identified and addressed in the care were not, on average, any longer than those in which context was overlooked. What most seems to differentiate the physician who is high performing at picking up on contextual issues and planning care that takes into account a patient’s individual needs and circumstances is the questions they ask patients.. Specifically, they notice the clues (contextual red flags, such as a Hgb A1c that shot up) and ask about them (“Mr. Jones, you seem to be having trouble managing your diabetes. Tell me what you think is going on?”). Then they take what they learn from the patient’s response and use that information in the care plan. The docs who do this don’t have longer visits…they are just better at asking the right questions, and their patient have measurably improved outcomes. If you’re interested in seeing the paper that documented that times were no different between visits where care was contextualized vs not contextualized, let me know and I’ll send a copy. Again, thanks for your interest. Phenomenal work by Saul, Fran and colleagues. So important to understand how to elicit important information – not well taught in training! – and then figure out how to embrace and integrate such skills. VA working to incorporate this knowledge into digital solutions, asking people about their agenda before a visit. Need patients and caregivers to help as well. In the spirit of @ePatientDave, Let Patients Help! First, there is the challenge of eliciting the patient’s agenda with questions such as “Anything else?” I gather that asking this question, or something similar, until the patient has gotten what’s on their mind out in the open does not on average add much time to the encounter (about 6 seconds apparently). While there is a fair amount of overlap, these are different aspects of the medical encounter. For instance, a patient may not be aware that certain things going on in their life have implications for care planning. They may not know, for instance, that a new job as a truck driver has implications for timing and selection of medications that are associated with drowsiness. 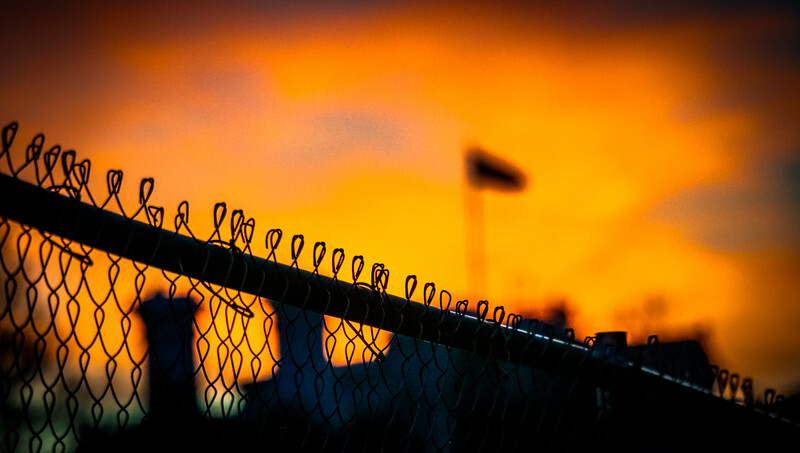 Hence, contextualizing care requires that the physician is on their toes….thinking of specific questions to ask to elicit information about the patient’s life that is relevant to care (based on the clues, or “contextual red flags”). We’ve shown that this does not add any time to the medical encounter on average, probably because asking the right questions also saves time since it leads directly to a care plan that makes sense to both parties. Eliciting the patient’s agenda is a different process than contextualizing care because, as noted by Ted, it really is about asking questions such as “Anything else” till everything is on the table. In sum, the clinical encounter probably should start with a focus on eliciting the patient’s agenda. Then, once that’s done, the physician needs to pick up on clues of contextual issues and start asking targeted questions so as to develop a contextualized care plan. This approach is grounded in knowledge of the patient’s agenda and their particular needs, circumstances and preferences (i.e. context). So, in the end, the care is based both on what the patient wants and what fits their particular needs. Is the ABIM listening to the huge outcry of physicians opposed to MOC? Physicians are not lashing out due to the regulatory environment, they are lashing out because they feel MOC is worthless except for generating ABIM revenues. Thanks for stopping by. Even though this is not a blog post about the ABIM :), I think it’s worth recognizing, relevant to this post, that there’s an outcry from patients because they are (a) not being listened to, with at times devastating results, and (b) listening/patient experience is currently not a part of certification for the profession, even though it has profoundly positive impacts.